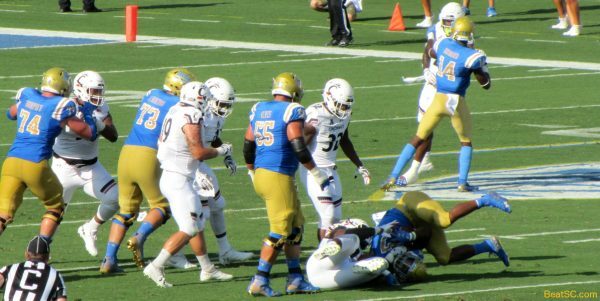 The Chip Kelly Era at UCLA got underway on Saturday, and it wasn’t pretty. 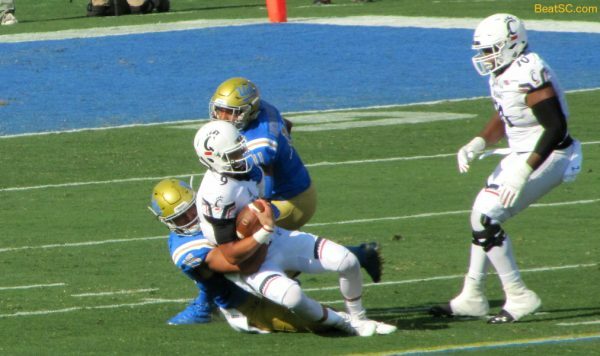 UCLA got beat — at HOME — by two-touchdown underdog Cincinnati, 26-17. The unranked Bearcats made the 2018 Bruins look like the 2017 Bruins — lousy, on both sides of the ball. 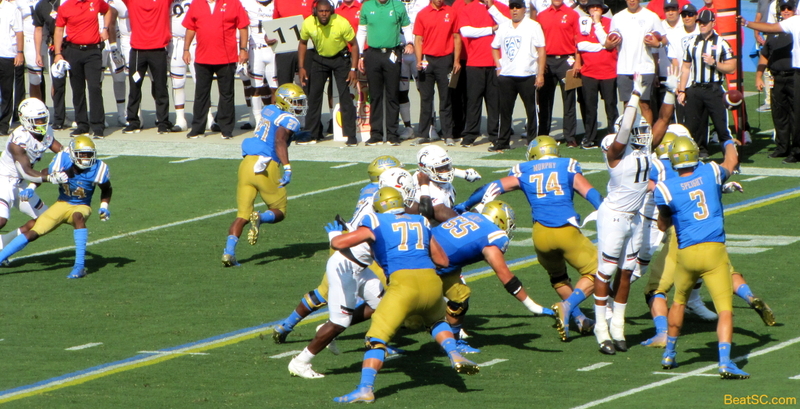 UCLA couldn’t run (with a 1-play exception), couldn’t pass, couldn’t catch, and couldn’t stop the run. They couldn’t even SNAP the ball well on a consistent basis. That recipe for disaster led to a depressing opening day loss that looked a lot like the last couple of seasons of the Mora regime, which led to Mora being replaced. The hope was that Chip Kelly would bring his innovative Offensive strategy to Westwood, but the misdirection that Kelly’s Oregon teams were famous for was not very evident on Saturday. There was one great fake that led to a wide open play, but the Receiver dropped the ball. 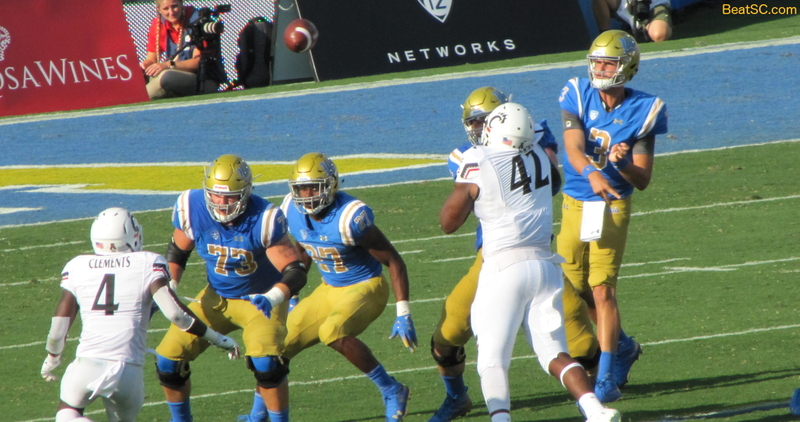 The Bruin Offense did operate quickly, with an uptempo pace that helped make Kelly elite, but it did not seem to bother the Cinci Defense at all. It did not give the Bruins the advantage that it always seemed to give the Ducks. 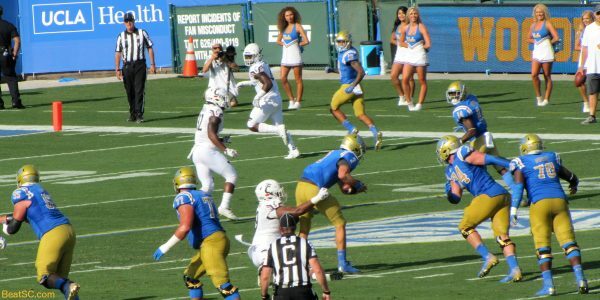 The Oregon pace was accentuated by the SPEED of individual players, and SPEED did come into play for UCLA on one play. 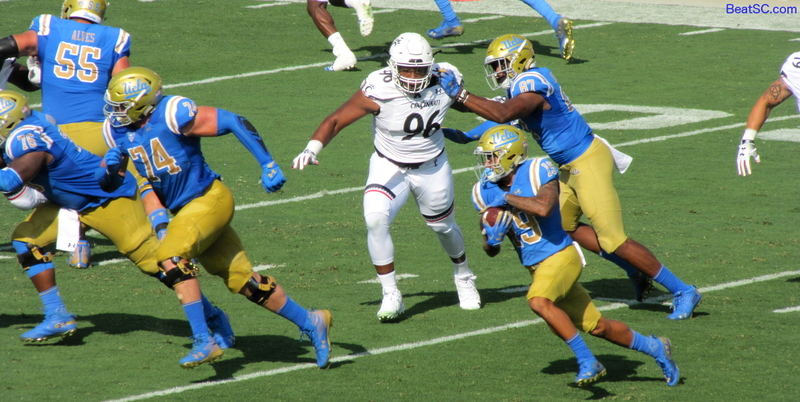 After getting off to a slow start, they got on a decent roll with Senior Wilton Speight taking advantage of a turnover to push UCLA to a 10-0 lead, but in the 2nd Quarter, UC scored 17 unanswered, capitalizing on a Speight Interception, to go to Intermission up 17-10. 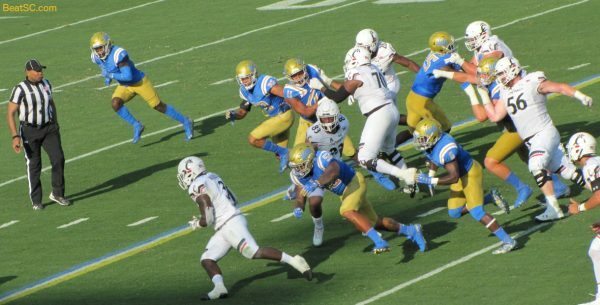 In the 3rd Quarter, the SPEED factor finally showed up, as TRACK STAR Kazmeir Allen ran for a 74-yard TD, which is 25 yards longer than UCLA’s longest TD run last year. 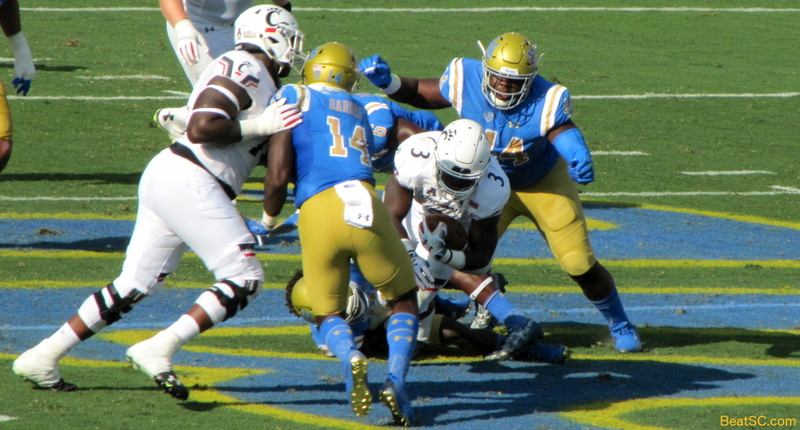 The Allen Touchdown tied the score at 17, but in the 4th Quarter, the Bearcats outscored the Bruins 9-0. On a fumble by Dorian Thompson-Robinson, they got a Safety to go up by 2, and then, with less than 2 minutes left in the game, they lined up for a Field Goal, but UCLA had 12 men on the field, so that led to Cinci going for it on 4th and 1, and scoring a TD to essentially clinch the victory. I am not giving up on Chip Kelly. He will make adjustments, and the team will improve. 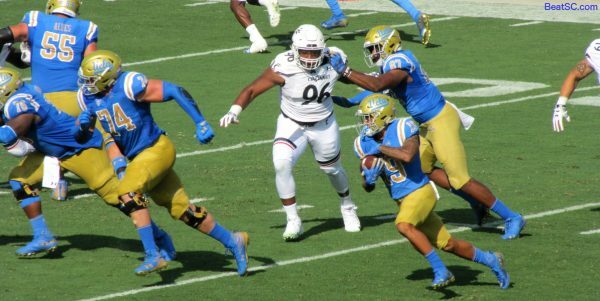 And there are plenty of legitimate “excuses” for the pathetic performance: 1) 6 players were suspended from the game; 2) The Best Defensive player was injured recently and is out for the season, replaced by a Freshman; 3) UCLA is one of the youngest teams in the Country [although Cincinnati is YOUNGER! 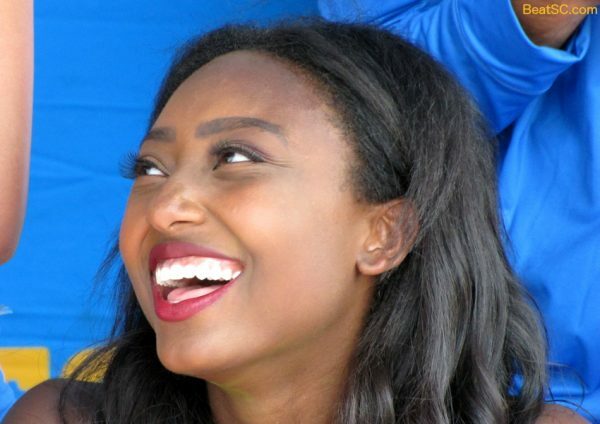 ]; 4) UCLA’s starting QB Speight got injured in the 2nd Quarter and did not return; 5) Speight was replaced by True Freshman Dorian Thompson-Robinson, who is a dual-threat QB, entering a game where the gameplan was designed for a pocket QB. There were also a few flashes of promise: 1) While the Offensive Line struggled, there were a few holes to run through (see photos below), and that was not very common last year; 2) Kazmeir Allen is a speed-burner, and will probably have several more breakaway runs this season [It is inexplicable that he barely saw the ball on Saturday AFTER his TD scamper]; 3) While the Defensive Line got abused by the Run, and made another run-of-the-mill Running Back look like O.J. Simpson [the Running Back part, not the Double-Murderer part], they DID manage to get into the backfield, harass the QB, and get some big Sacks; 4) After a couple of early-jitters False Starts, the Bruins committed less penalties than last year, no Defensive Pass Interferences, and had SEVERAL good-coverage pass break-ups, rarely if ever getting burned deep by the Cinci passing attack. 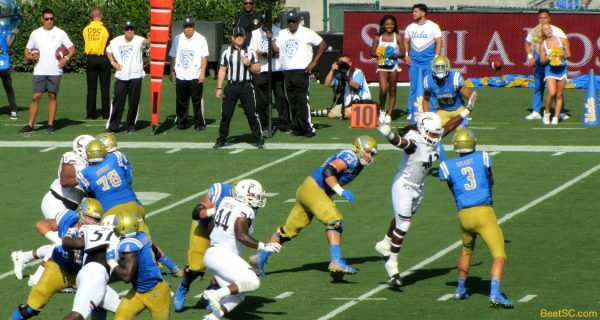 Darnay Holmes and Krys Barnes each had a textbook “pass defensed;” 5) Both QB’s looked good at avoiding Sacks, extending plays, and finding open space to make a play — more mobile/elusive/stronger than Josh Rosen actually, leg-wise. So with all those positives and silver linings, you’d think that losing this game, to the weakest team on the whole schedule, isn’t a death knell for the season. But so many bad snaps, and so many errant throws by both QB’s, and dropped passes by several players including a game-changer in the 3rd Quarter of a tied game by Christian Pabico — and about 20 missed tackles — say otherwise. Cinci even had a key defensive player ejected for Targeting in the 1st Quarter, and UCLA still couldn’t get any rhythm going. The magic of Chip Kelly will need to fix all that before the Conference schedule begins. UCLA has the toughest schedule in the Country according to ESPN’s mathematical formula, and the “easiest” game just turned into a 9-point loss at Home. To add insult to injury: My seat is on the goal line, and ALL FORTY-THREE POINTS in this whole game were scored in the OTHER end zone, 100 yards away from me and my camera. 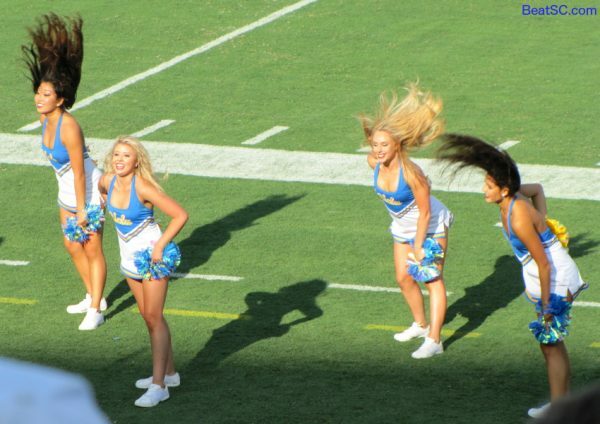 At least the UCLA Spirit Squad now splits into 4 groups, so my section has a Spirit Squad contingent in all 4 quarters. And on a day like this, that was the SAVING GRACE of the event. Here are 62 more GAME and CHEER photos from today. There will be a flood of Spirit Squad photos coming over the next 13 days, before the next home game, so check back soon. 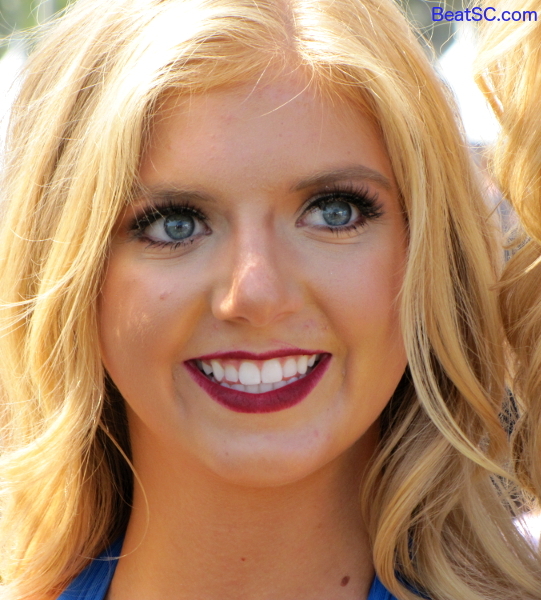 As you will see in a moment, the new influx of talent, beauty, and grace to the Spirit Squad is phenomenal. Welcome to Westwood, Wilton, land of no time to throw. 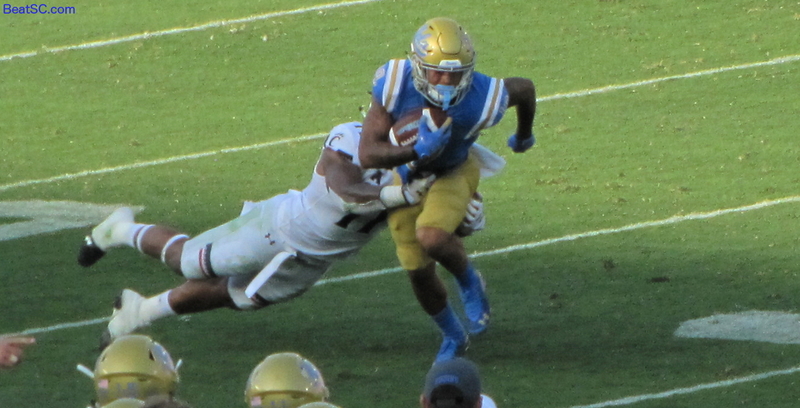 Nate Meadors leaves his feet fo make a sideline tackle. A Bearcat ballcarrier gets upended. Speed Demon Kazmeir Allen runs wide. Allen tries the left side again. Bolo Olorunfunmi scores UCLA’s first TD of the year, on a short run. 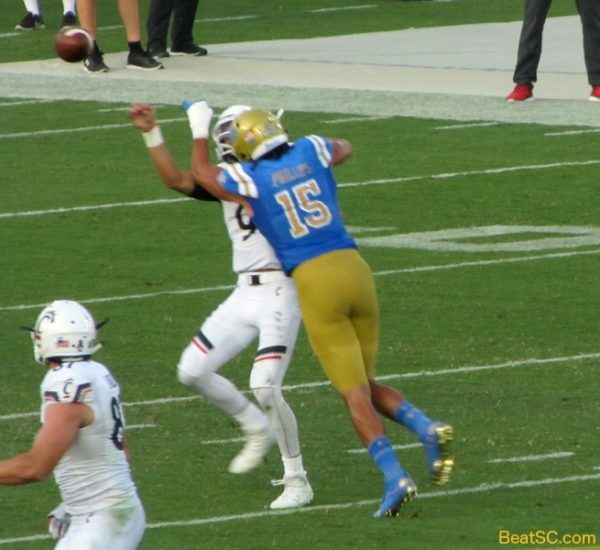 Jaelan Phillips gets the Sack. Michael Warren rushed for 143 yards, but not too many on this one. Wilton Speight gets caught by the jersey. Joshua Kelley gained only 21 yards, on 6 carries, and not too many on this one. 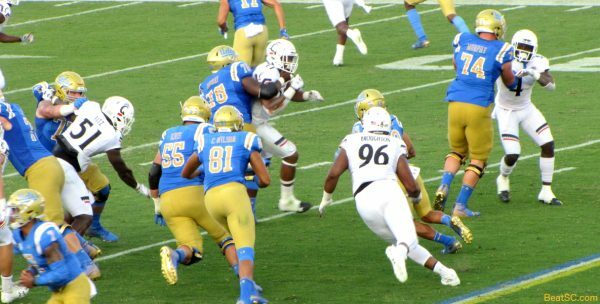 It takes an illegal “block” to keep Keisean Lucier-South out of the Bearcat backfield. Speight gets a pass off. Freshman Kyle Phillips makes an awkward grab of a pass behind him. 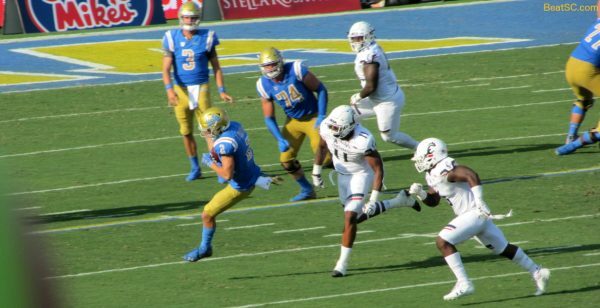 The days of Rosen’s perfectly-placed balls is also behind us. DTR has an unorthodox throwing mechanic. But he did show a Hundley-like knack for elusivity. The Bruin runners did not break a lot of tackles. Warren finds a lot a daylight here. This is the beginning of Kazmeir Allen’s 74-yard Touchdown. Same play, as Allen gets to the next level. 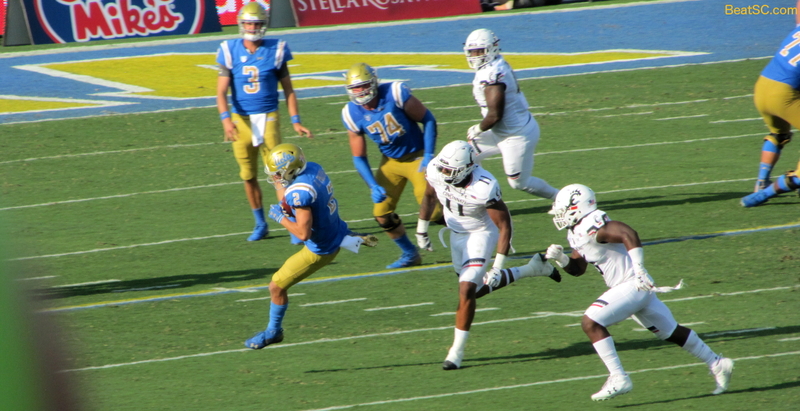 Afterburners fire, and Allen is in the end zone, for the only true Bruin highlight play of the game. 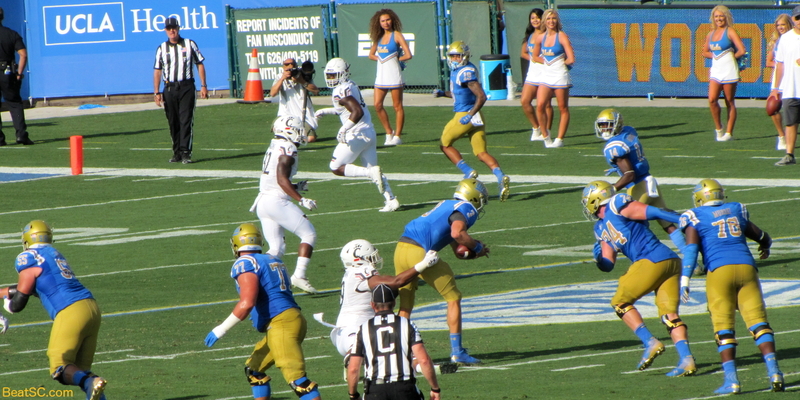 Jaelan Phillips pressures the QB again. 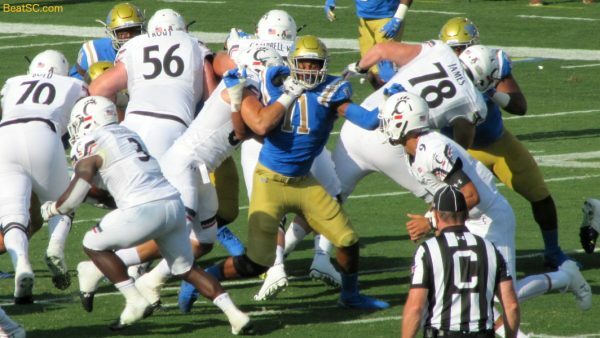 Here’s the example I promised of a big hole created by the Bruin O-Line. However, it collapsed quickly and did not lead to a big gain. 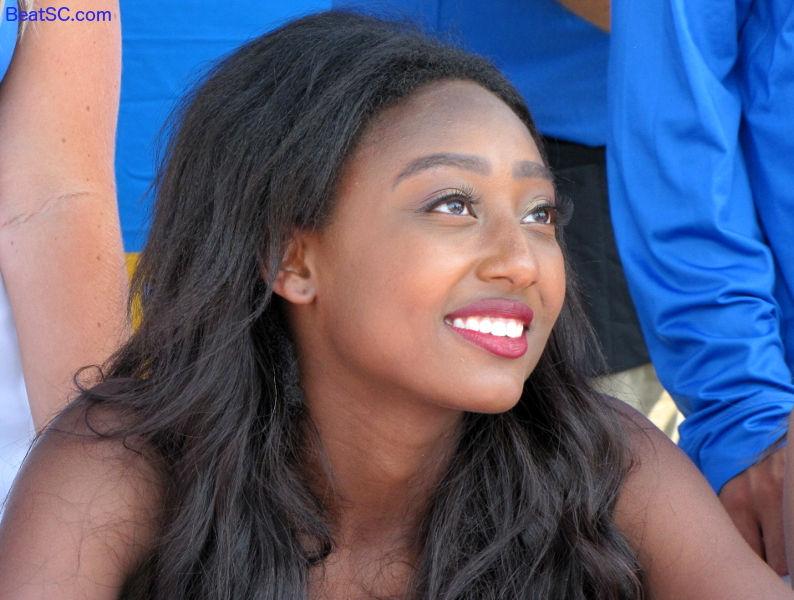 "ALL THAT AND A BAG ON CHIP" was published on September 2nd, 2018 and is listed in Blue & Gold News, UCLA/usc/Cheerleader Photos, UCLA/usc/Sports Photos. Thanks T-H not only for the pictures but for your write-up. I think we all thought the team would look sharper and execute better. Instead, I was reminded of some CRN openers. Also, for the umpteenth season, UCLA has a poor OL. I know not all of that is on CCK but it sure is frustrating. We’ll see what happens. GO BRUINS!